I very much like your rendition of Link here. Maybe even better than Nintendo!!! You've captured the feel of the game perfectly. Love it! WHY DIDN'T THIS SHOW UP IN MY NOTIFICATIONS. AAAAAAAAAA IT'S SO COOL awww i wish i could rock watercolor like you do! Oh my god this is amazig. Link looks so handsome and his horse has amazing details. When I look at this, I can almost feel a soft breeze during sunset an hear the soft breaths of the horse. It is so incredibly beautiful!!! Wow!!! Love how Link came out and the colors you used. I feel you really did capture the atmosphere of the new Zelda game. Brave hero and horse, together till the end. WOnderful work. The textures and colors are awesome. Oh my! That's amazing! Thank you for sharing that! Excellent work, Your achievements speaks itself about your capabilities. Slow and steady makes it to the top! Good job! Check my new project in your free time. Thanks! Wow, it's very breathing taking! I want to play the new Zelda so badly... But... yeah, I feel ya... I'm waiting for more games too. Das sieht wunderschön aus! Du bist wirklich ein beeindruckender Maler!!! 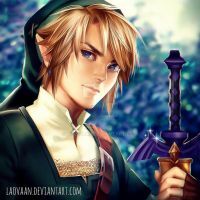 You draw the best Link art around here. Very awesome! Woah, I love this piece so much! The details and colors are amazing~! Link especially looks fantastic. I was wondering if I could use this as my personal background for my computer. I wanted ask you if that was okay with you? I don't want to post it anywhere else, just as background and nothing else.